Senate Energy and Natural Resources Chairwoman Lisa Murkowski said yesterday she wants the Trump administration to quickly nominate a replacement for Robert Powelson, who recently announced he would resign in August from the Federal Energy Regulatory Commission. Wary of the potential pitfalls stemming from the 2-2 partisan split that will remain at the five-member independent agency once Powelson leaves, the Alaska Republican said she is going to "put a fire" on the issue. Powelson's departure to lead the National Association of Water Companies will upend FERC, giving Democrats at the agency the opportunity to wield more influence on a number of issues (Energywire, July 2). Particularly important will be pipelines, as Democrats Richard Glick and Cheryl LaFleur have dissented on FERC's approval of several recent natural gas projects, citing their disagreement with the Republican majority's decision to limit consideration of greenhouse gas emissions. With the 2-2 split, any natural projects up for final approval at FERC could be delayed until a new Republican commissioner is confirmed. Murkowski tied the vacancy to the Trump administration's desire to boost energy infrastructure in the U.S.
"I hope that there is an appreciation as to the significance of a FERC that could be in a position where they might be deadlocked on some of these issues that would be priorities of this administration," she told reporters after a committee hearing yesterday. 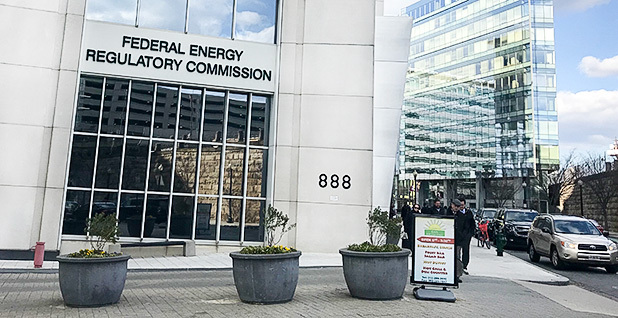 "Whether it's the FERC or whatever regulatory body, when it is an even number, it's easier to find yourself at an impasse. So I'd look to get a full complement of five and get everybody in their positions," Murkowski said. "So I'm going to kind of put a fire on this. We worked very aggressively last year to get the FERC filled out. We'll just do it again." Murkowski led the Senate's approval of three FERC commissioners last year: Chairman Kevin McIntyre, Powelson and Glick. The hopes of a speedy Senate confirmation could be complicated for Trump's new FERC nominee by the looming debate over Supreme Court pick Brett Kavanaugh. Murkowski, a moderate pro-abortion-rights Republican, will be under particular pressure as a potential swing vote. Murkowski said she had not yet talked to anyone in the Trump administration about the open FERC job and declined to say who she thought should get the nod. But she did ask two former FERC chairmen who were testifying in her committee yesterday what characteristics prospective nominees should have. James Hoecker, who was chairman from 1997 to 2001 and is now an energy lawyer, said he thinks members should include "seasoned economists, industry engineers, not just lawyers." "I think that those diverse skills have served the commission well in the distant past, and I think that would be a good idea," he said. "You want somebody with a judicial temperament, someone who doesn't have a particular ax to grind who can make independent decisions." Joseph Kelliher, chairman from 2005 to 2009, said the nominee should be "comfortable with criticism." "Someone who is independent by temperament, someone who will follow the record and someone who will try to work with their colleagues ... but only up to a point," he said. "It's not supposed to be 5-0 on everything, it's OK to dissent." In addition to the pipeline disputes, FERC has worked on contentious orders in other areas recently, issuing split decisions on fuel security in New England and possible reforms to the capacity market run by grid operator PJM Interconnection. Kelliher, like Murkowski, said that the 2-2 split "has the tendency to divide evenly sometimes." "Four is a scary number," he said.